After being invited to this event for several years, we were finally able to attend this year. Special thanks to our good friend, Muff Davis, for the invite and extra ticket. 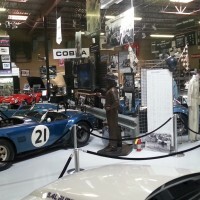 This is the annual fundraising party to benefit the day-to-day running of the Shelby American Collection Museum in Boulder, Colorado. There was good food, great sponsors, music, lots of show cars, and some amazing special guests. 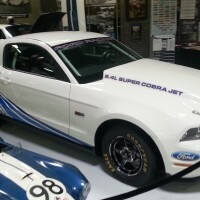 After taking some time to look at several really nice cars outside the museum, we went inside to see some truly incredible Shelby history on display. 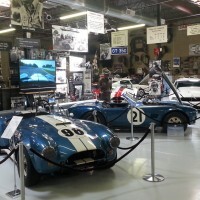 Multiple Cobra race cars, several rare Mustangs, lots of memorabilia, a really nice gift shop, a bar, and a LeMans Ford GT40 race car that really steals the show. We were impressed with the 1966 Shelby GT350-S prototype supercharged Mustang. It is really nice to see such a rare, one-of-a-kind car on display for all to see. 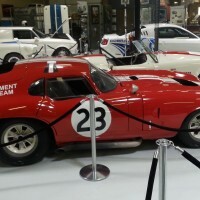 The GT40 has some amazing history as well. 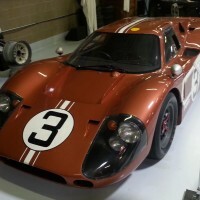 Knowing that world-renowned drivers like Mario Andretti, AJ Foyt, Dan Gurney, Bruce McLaren, and Lucien Bianchi drove this car and its sister GT40s is really impressive. Of course the Cobras in the house that drivers like Bob Bondurant, Allen Grant, and Tom Yeager drove to wins are equally impressive. On top of that, to meet and get to chat (plus get some autographs) with all three of these amazing drivers was a treat. 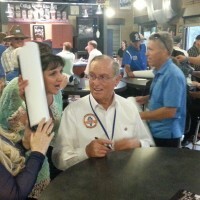 All three shared some funny stories of their time racing for Carol Shelby. We even had a great Mustang vs. Corvette conversation with Allen Grant. With 300-400 people in attendance, we hope that the event was considered successful. Steve Volk, founder of the collection, and his family really put on a great event. We look forward to coming back next year! Speed Gone Wild was a WIN! 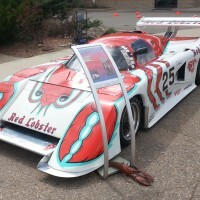 Despite the rain making a very unwelcome appearance at times, Speed Gone Wild Weekend at Boulder County Fairgrounds in Longmont on June 5-7 was an amazing success! Over 3o cars braved early morning rain for our first-ever driving skills event at Colorado National Speedway. Times were good on a wet track early in the day, but got much better as it dried up for an incredibly fun event! Friday night, our weekend’s presenting sponsor, Longmont Ford, held a Garage Nights event at their dealership in Longmont. Great food, free beer from Left hand Brewery and Oskar Blues Brewery made it a great evening! 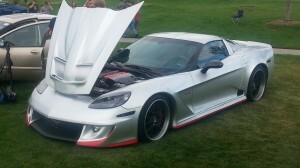 Saturday morning’s Speed Gone Wild car show was a hit! 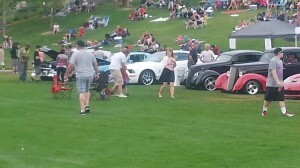 We officially had over 300 cars, trucks, and motorcycles on the grass at Boulder County Fairgounds. We had to speed up the trophies a little as a small rain shower creeped in, but overall a great success! 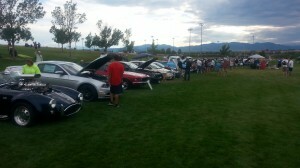 Sunday morning was the Canyonball Run Rally put on by the Northern Colorado Mustang Car Club. 71 cars split into two groups going opposite ways on a beautiful run to Estes Park and back. Everything ended up at Oskar Blues Brewery in Longmont for the end of the rally and the end of weekend car show. Free lunch for participants, free beer and root beer from Oskar Blues, great weather and a great culmination of an amazing weekend. We look forward to doing it again next year. Visit SpeedGoneWild.com for driving skills event times and pictures of the event! 2015 Fireworks Car Show is a GO! RMCC had a great meeting with the City of Westminster this week and the mood in the room was good! They really liked how well the 2014 show went, and want us back again in 2015! We will be doing more cars, more vendors, trophies, and door prizes, plus a strong request for no rain this year! For those who didn’t make it out last year, it rained! It rained hard! However, it all cleared up around 6pm, and the night was a HUGE success! We had space setup for 50 cars, and 37 showed in the rain! The fireworks were outstanding on top of a great night. The show is held ON THE GRASS at Westminster City Park, right under the fireworks show. Sorry this is a month late on the first one. 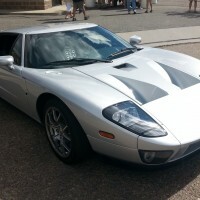 Things have been extremely busy at ColoradoCarShow.com! 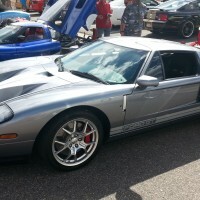 The 2nd and 3rd OutRock Car Shows of the year went off even better than the May show! 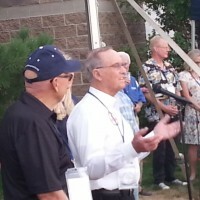 The June 29th show was hosted by the Good Times Corvette Club and was a great time! 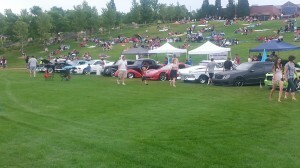 We had over 225 cars and well over 10,000 spectators show up for this event! With the Corvette Club hosting, we had over 90 Corvettes in the show! Special thanks to the show presenting sponsor – Sill-Terhar Motors in Broomfield. Jack Terhar and crew brought out a couple Maseratis, a beautiful Aston Martin, and the incredible Jaguar F-Type R Coupe. We had everything from old classics to muscle, and sports to exotics at the event. The show ended with the distribution of 36 class medals and 9 specialty trophies. The July 19th show was also a night show and concert from the rock and roll cover band Doctor Fine. The show was another success with over 160 cars and close to the average 10,000 spectators. The military vehicles showed-up in force at this event! We had several trucks, troop carriers, Jeeps, and a cannon! The star of the military vehicles was an amazing (probably priceless) amphibious Jeep. According to the owner, this jeep is still capable of amphibious operations! The exotic class was another surprise. Avery custom 1923 hot rod won the best exotic medal. We gave out 24 medals and 5 specialty trophies. The show ran until 7pm, when the band started playing. Special thanks again to Sill-Terhar Motors in Broomfield for being our presenting sponsor, and to Douglas County Diesel/Castle Rock Auto Repair for being our concert presenting sponsor. We look forward to the final OutRock Car Show of the summer on Sunday, August 17th, from 10am – 4pm. Please join us at the Spirit of Flight Center on Saturday, July 12, 2014 from 10AM-4PM for the 6th Annual SPIRIT OF FLIGHT DAY. Aircraft displays and fly-bys, BIG Car Show, WWII Veterans and Tributes, Re-enactors, Jet Cars, Vendors, Food, Band, Kids Stuff, Beer Garden, Museum tours, Door Prizes, Plane and Helicopter Rides, and tons of FUN! Trophies for best car/motorcycle/plane. Fun for the entire family! Just $5 admission! The Spirit of Flight Center is located on the west side of the Erie Airport. Visit http://www.spiritofflight.com for more information. June 29th OutRock Car Show Preview! 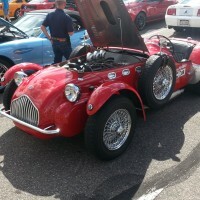 The June 29th OutRock Car Show presented by Sill-Terhar Motors at the Outlets at Castle Rock is what you would call sold out! 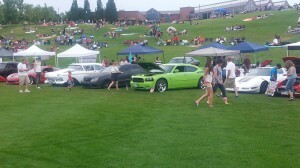 The mall has limited the show to 200 cars, trucks, motorcycles, etc…. and there are 200 vehicles registered! Everything from rods and muscle cars to a BUNCH of Corvettes and exotics. The host car club for this show is the Good Times Corvette Club. The show has Corvettes from Looking Glass, TORCA, Colorado, Colorado Springs, Rebel, and Down the Road Corvette Clubs coming. Plus there will be a multitude of Mustangs from Northern Colorado Mustang Club and Southern Colorado Mustang Club, plus several who did not list a club. 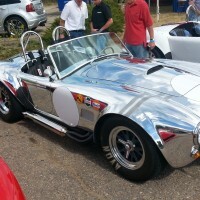 This is significant since the Southern Colorado Mustang Club is hosting the July 19th OutRock Car Show, and the Northern Colorado Mustang Club is hosting the August 17th OutRock Car Show! The OutRock shows are FREE to register, FREE for spectators, and the registrants get a FREE pancake breakfast from Chris Cakes. 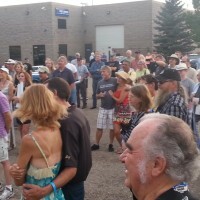 The June and July shows are presented by Sill-Terhar Motors in Broomfield. The July 19th show is a night show with a concert presented by Douglas County Diesel and Castle Rock Auto Repair. The August 17th show is presented by Michael’s Auto Body in Castle Rock. The May 18th show had approx. 190 cars and over 10,000 spectators. The shows are limited to 200 show vehicles and expect over 10,000 spectators at each show. A portion of the proceeds of each show goes to the Morgan Adams Foundation to help children’s cancer research. 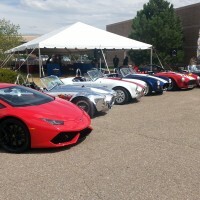 The shows are all organized by the Rocky Mountain Car Club and ColoradoCarShow.com. 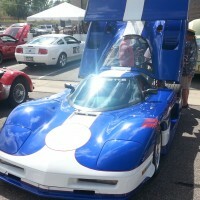 Visit OutRockCarShow.com for more information and to get registered for the July 19th and August 17th shows! 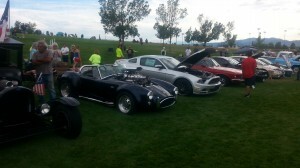 The first OutRock Car Show and Concert Series event presented by the Rocky Mountain Car Club on Sunday, May 18th, 2014 was a huge success! Over 150 cars entered the show, and another 40+ cars came out to check out the event for the following months or just drove by and wanted to see what was happening. A rough estimate of the spectators who showed up over the course of the day is over 10,000. Proceeds from all four OutRock Car Shows will go to the Morgan Adams Foundation for childhood cancer research. The vehicles that showed up were from all years, makes, models, and types. Everything from huge military wreckers, to vintage cars, sports cars, exotics, modified cars, and trucks made a splash at the show. The military vehicles were a big hit and one of them actually won 3rd place in the truck category. All registrants who came in before 10am received a free pancake breakfast from Chris Cakes. Door prizes were given away every half-hour until the 2pm awards ceremony. Thank you to the guys and gals from Fatal Creations Car Club who helped put on this show! Elevation Motors and Elevation Auto Spa put on their first monthly cars & coffee event at the LeMay Car Museum building near 8th Ave and Simms in Lakewood. They will have a cars & coffee every third Saturday of the month with free coffee and doughnuts. 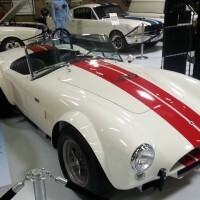 The museum and Elevation Motors has some incredible cars to see in the building in addition to the great show cars. The weather was not looking too good early in the day, but gradually got nicer throughout the morning. We estimate approximately 75 cars came through at various times during the time of the show. 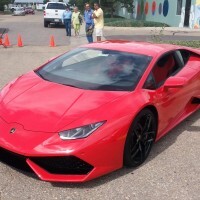 Some of the cars included Ferrari, Porsche, Audi (several – including R8), Corvette, Pantera, Buick GNX, Camaro, Aston Martin, Lotus, Mustang, Lamborghini, Nissan GT-R, Viper, Acura NSX, and several older muscle cars of various makes and models. Throw in the great selection of cars inside, and the show was well worth the visit. We look forward to visiting the event next month. 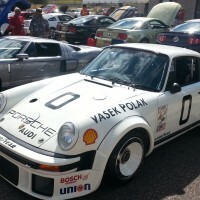 Emich Volkswagen held its 1st annual track day at High Plains Raceway on Sunday, April 20th. The weather was amazing for this Easter event. Nearly 50 cars/drivers came out for an entire day of private lapping. Plus, there was another 60 guests and spectators who hung out, had fun, and got some great ride-alongs in the Emich VW Jetta GLI World Challenge race car, some great VWs, and some rides in the GO 4 IT Racing School Corvette C7 Stingray. Glenn and his staff at HPR were great as usual. Emich plans on making this an annual event, so look for another day next spring. The 2014 Denver Auto Show is under way. The show opened last night to the public and runs through the weekend. The show started-off with the charity preview party on Tuesday night. Without knowing the total number of people in attendance, we can say it was a very large crowd. The attendance has gone up consistently over the past few years. There was a fashion show, great food and drinks, and the Rocky Mountain Automotive Press presented the Rocky Mountain Car, Truck, and SUV of the Year. The car of the year is the 2014 Lexus IS250/350. The truck of the year is the 2014 Chevrolet Silverado. The SUV of the year is the 2014 Jeep Cherokee. Also, John Elway was on-hand as an honorary chair of the event. The show opened to the public last night. The selection of cars and number of manufacturers is impressive. Some of the newest vehicles include the 2015 Ford Mustang, the 2015 Chevy Silverado High Country, the 2015 VW GTI, the Nissan GT-R NISMO edition, and the latest from many other brands. Some foreign highlights are the new Jaguar F-Type Coupe, the Lamborghini Aventador, several examples from Ferrari, Maserati, Mercedes, BMW, Porsche, Lotus, Aston Martin, Bentley, Subaru, Audi, Toyota, Kia, Hyundai, Mazda, Nissan, Volkswagen, Land Rover, and Fiat. Although the foreign vehicles seemed to outnumber the Americans, there are some great examples from Chevy, GMC, Cadillac, Buick, Ford, Lincoln, Dodge, Chrysler, RAM, Tesla, and even the MV-1. Overall, this was a great show and we are looking forward to next year.